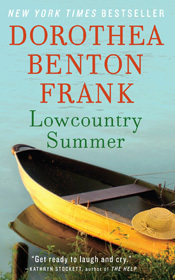 Wonderfully evocative, infused with humor and poignancy, and rich with the lyrical cadences of the South, Lowcountry Summer is vintage Dorothea Benton Frank, a deeply moving novel you'll want to savor and share. Describe Caroline's relationship with her brother and the rest of her clan. How do the young people in the novel behave towards each other and towards their elders? What things might Laviniacoming from a different generationhave taken for granted that Caroline cannot? What accounts for these differences? How do the three generations of Wimbley women compare and contrast with one another? What is Millie's role in the story? How would you characterize her relationship with Caroline? Caroline firmly believes in good manners and propriety. Why? Do you think these attributes are out of dateor are they more necessary than ever in today's world? Tradition is also important to Caroline. "Families like ours and Miss Sweetie's never downsized and moved to condos in Boca. Sell the blood-soaked land our ancestors had died to protect? Never in a million years! We stayed where we were born until we drew our last breath, making sure that our heirs swore the same fealty to the cause." How does such loyalty shape a person's life? Can someone be too loyal? When can loyalty to a cause, a place, a person become destructive? "In our world, women took care of everything, especially each other, and the art of making each other look good was something that gave us great joy and satisfaction," Caroline explains when pondering her niece, Belle's graduation. "Lesson one of adulthood was putting the needs or even just the wishes of others before your own and then taking pleasure in making them come to pass." Do you agree with Caroline's assessment? Dorothea Benton Frank uses the Lowcounty as both a setting and a character in the novel. How does this place shape its inhabitants? How would you describe it? Have you ever had a connection with a place like Caroline does with Tall Pines Plantation? Would having such a link be comforting or confining? Compare Caroline with her sister in law, Frances Mae. Why do they dislike each other? Are they alike in any way? How can the two join together in the name of the family? Could such a bond be strengthened? Can it last? The bondor lack of onebetween parents and childrenis a prevalent theme of Lowcountry Summer. What is Trip's relationship like with his daughters? Why is he so helpless to contain them? Was he placing too much of a burden on his beloved, Rusty, to care for them? What did the girls think about their mother? What makes a good mother? Trip asks his sister if she thinks his relationship with Rusty is wrong. How would you answer this? Should Trip have stayed with Frances Mae? Do you agree with his choices at the end? Do you think reconciliation can work? How much does success depend on Caroline? Did Caroline overreact when she discovered her other niece, Linnie, was smoking pot at Belle's graduation party? Could she have handled the situation better? Did Linnie deserve the slap she got from her aunt? Millie doesn't like hitting and slapping, "But maybe sometimes a chile needs something to shake 'em up. Specially that knucklehead [Linnie]." What do you think of this? What about Caroline's feelings for Matthewwhy was she so reluctant to admit how she really felt about him? What do you think the future holds for them? The book is filled with several rites of passage: weddings, funerals, a graduation. How is Caroline's position as matriarch defined by these rites?